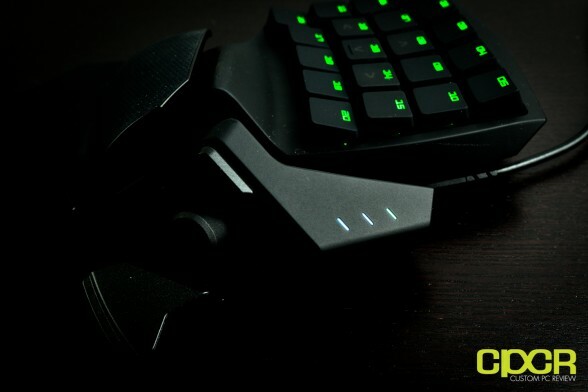 Having been a keyboard/mouse gamer my whole life, I’ve always been a huge fan of Razer products ever since the days of the Diamondback and the Boomslang, and when Razer unveiled the Nostromo gaming keypad a couple years back, I thought it was possibly one of the coolest peripherals ever. At the time it kinda felt like something that had dropped out of the command center of the USS Enterprise or something as it was something that just seemed like it could be the future of the gaming peripheral. 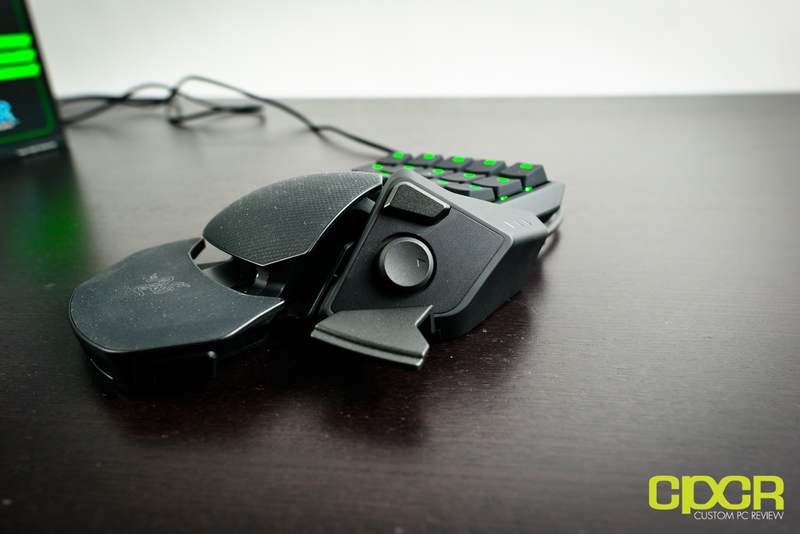 While I did get to play with demo units of the Nostromo here and there, I never actually ended up owning one, which is why I was so excited when Razer offered me the opportunity to review the Orbweaver. 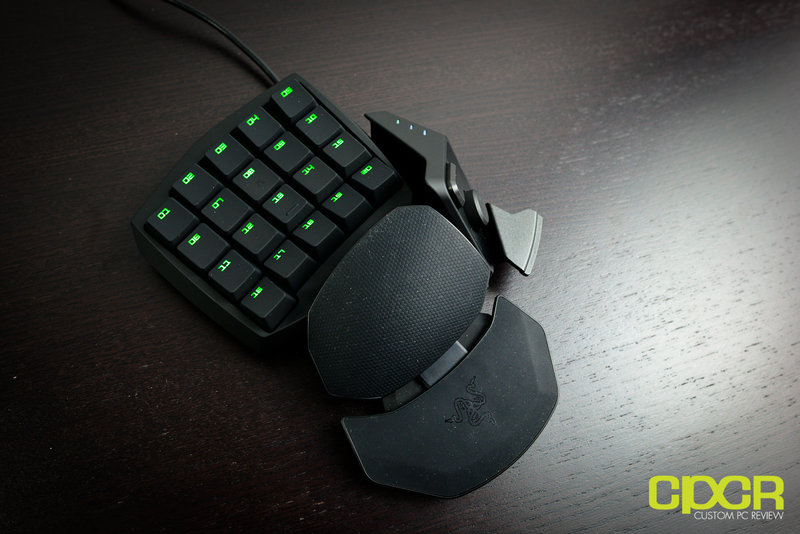 For those who’ve never heard of the Razer Orbweaver or the Razer Nostromo, both the Orbweaver and the Nostromo are what Razer calls gaming keypads. As its name implies, it’s basically a miniaturized keyboard meant to be used by only one hand. 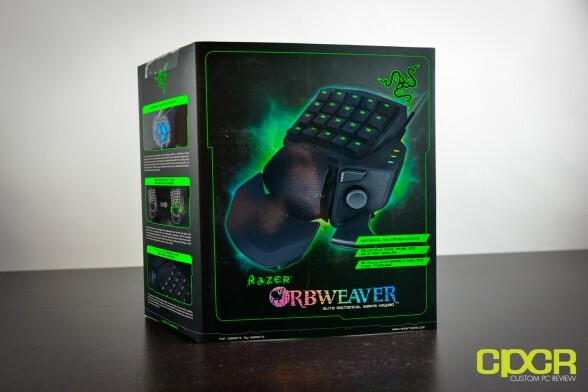 The special thing about the Orbweaver is that Razer is using Cherry MX Blue mechanical keyswitches for the keys, which gives each key a nice, even, tactile and clicky response that’s become so popular with the recent surge of mechanical keyboards as of late. 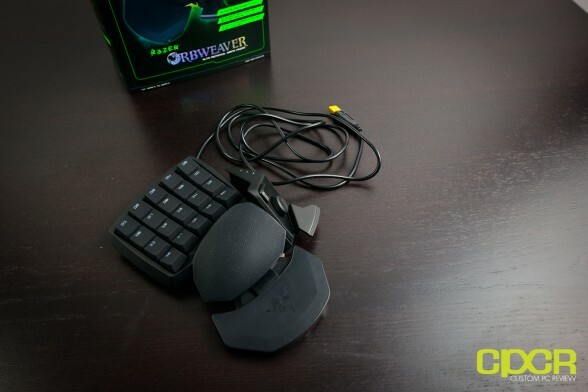 That said then, is the Razer Orbweaver reason enough to forget about the good old keyboard? Let’s find out! Here’s a look at the familiar Razer green/black themed packaging. 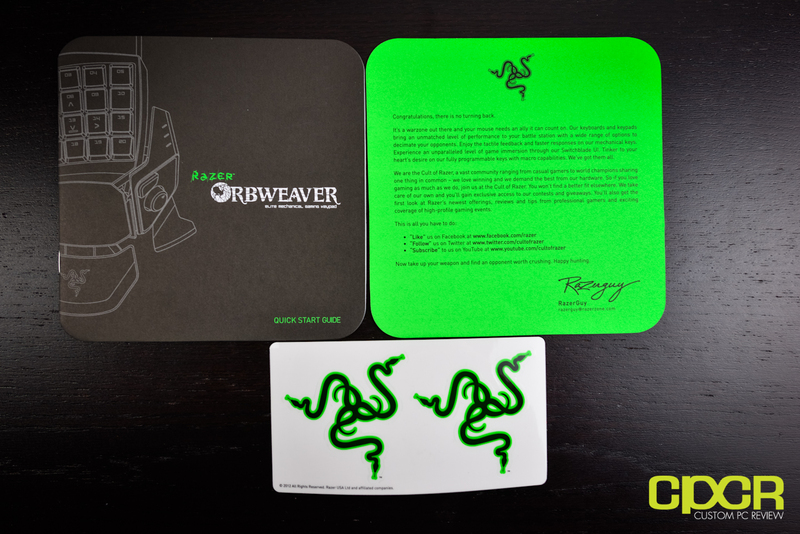 Inside we get some documentation along with the usual Razer stickers. Documentation aside, we get the Orbweaver itself. Oh my it looks so cool. Let’s take a closer look. Starting at the connector here, we’ve got the usual gold plated USB connector Razer is oh so famous for. 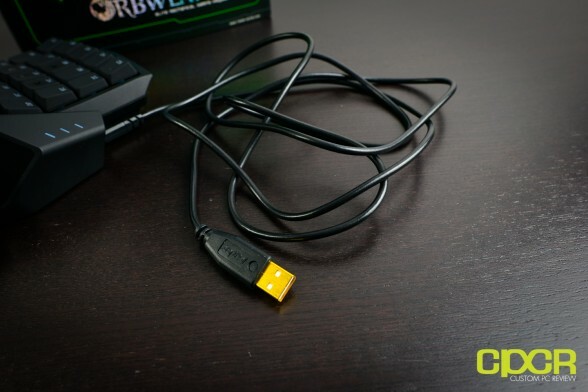 As for the cable however, it seems like Razer has decided to not go the usual braided cable route, so all we’ve got is the unusual thin plastic cable. For a mechanical gaming keypad that costs the same as a mechanical gaming keyboard, it’s odd that Razer decided to cut costs here. Alright, so plugging the Orbweaver in, we can see that the unit is green backlit. This is the only backlighting color, which seems to be the theme for all recent Razer products. The main keypad has a total of 20 programmable keys along with an adjustable wristrest and adjustable palmrest as well. Moving to the right side of the keypad, there’s also an 8 way d-pad, a button above the d-pad, and a wing-like button below the d-pad. Like the keys on the main section of the keypad, these buttons are fully programmable as well. 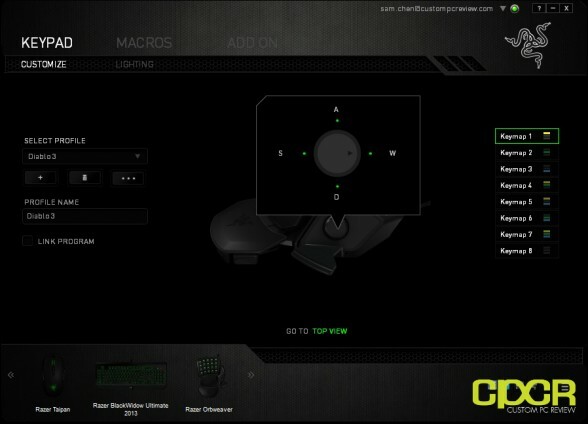 Above the d-pad on the right side, there’s a profile indicator that lets you know which keymap is activated. A total of 8 different keymaps are available and an unlimited number of profiles are available as well to pretty much create an unlimited number of key combinations given you want to spend the time programming it. As mentioned earlier, the palmrest is adjustable by pulling out the pin shown here. Once the palmrest is adjusted, it can be locked back into place by pushing the pin back in. If it’s more comfortable having the palmrest loose, you can simply keep the pin pulled out as well. The palmrest is adjustable by pushing on the button as shown here. The palmrest may be pulled out or pushed in to increase or decrease the length of the Orbweaver. Finally, the thumbrest may be adjusted as well. Here’s a look at the bottom of the Orbweaver with everything adjusted to the maximum length. 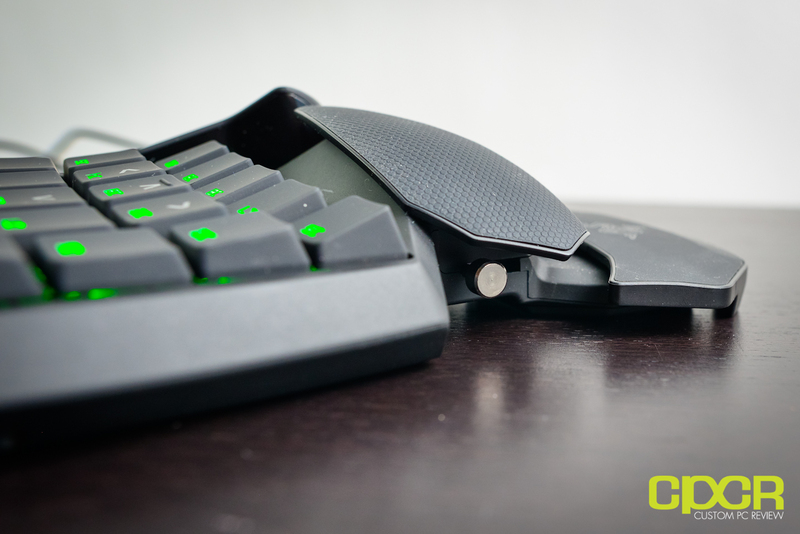 Also notice at the bottom that Razer has included a ton of large rubber feet to keep the Orbweaver from shifting during intense gaming sessions. Removing a couple keycaps on the Orbweaver, we can see that Razer has gone with Cherry MX Blue keyswitches which are both clicky and tactile. 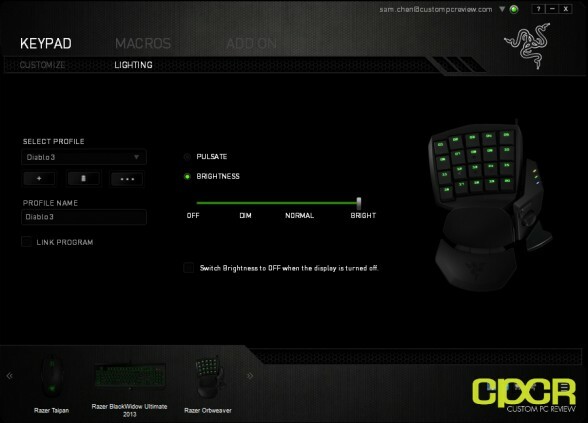 This should be familiar for anyone who owns a Razer BlackWidow. 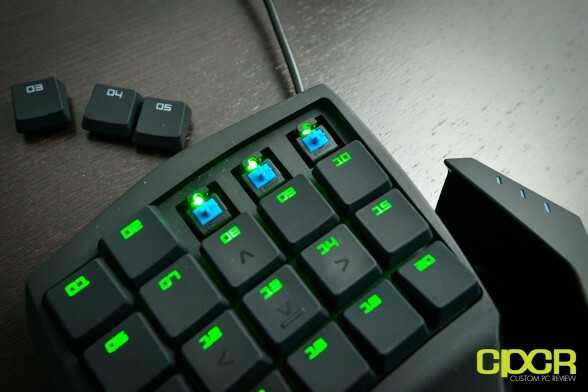 Additionally, each key is individually backlit as well which allows backlighting to be both bright and even. Like most Razer products out there these days, the Razer Orbweaver is designed to be used with the Razer Synapse 2.0 software. 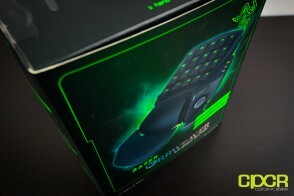 No software is included in the packaging, but it can be downloaded through the Razer website. Despite how complicated the Orbweaver looks, it’s nothing more than a giant keypad for programming keys and macros, so there’s not much to the software. 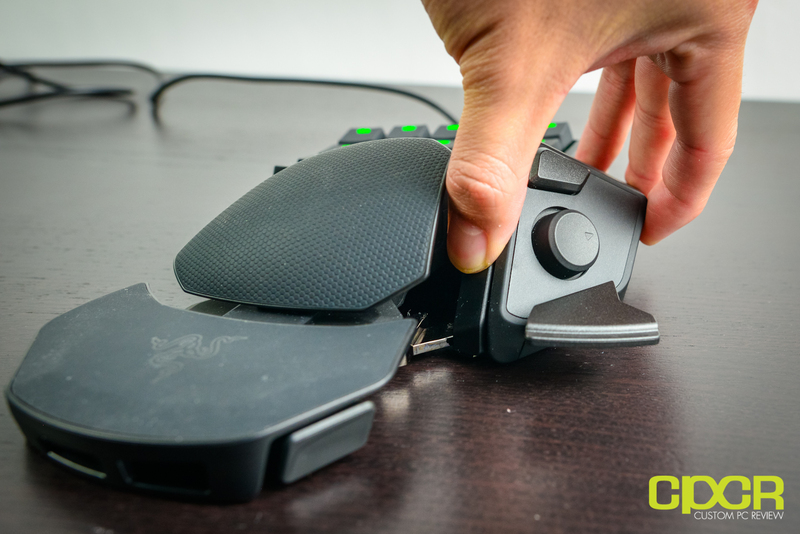 If you’ve ever used the Synapse 2.0 with any Razer mouse or keyboard, you should feel right at home with the Orbweaver. 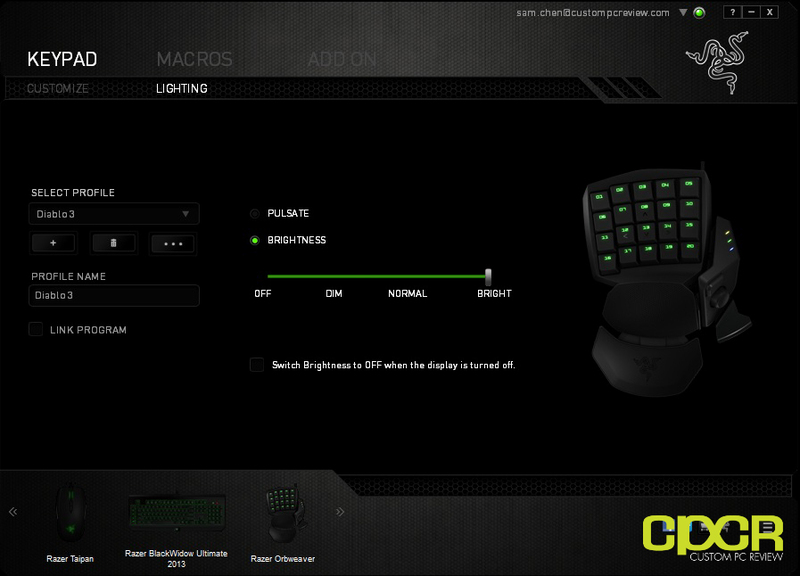 Simply create a profile on the left, choose a keymap on the right, and click each button to program them individually. By default, the keypad is programmed to act as the left side of the keyboard where you’d normally place your fingers. For example, button 8 is w, button 12 is a, button 13 is s, and button 14 is d. Get the picture? The d-pad along with the two buttons on the side of the keypad are programmable as well. It’s interesting using your thumb to walk around in Battlefield 3. Feels different compared to the usual WASD configuration. 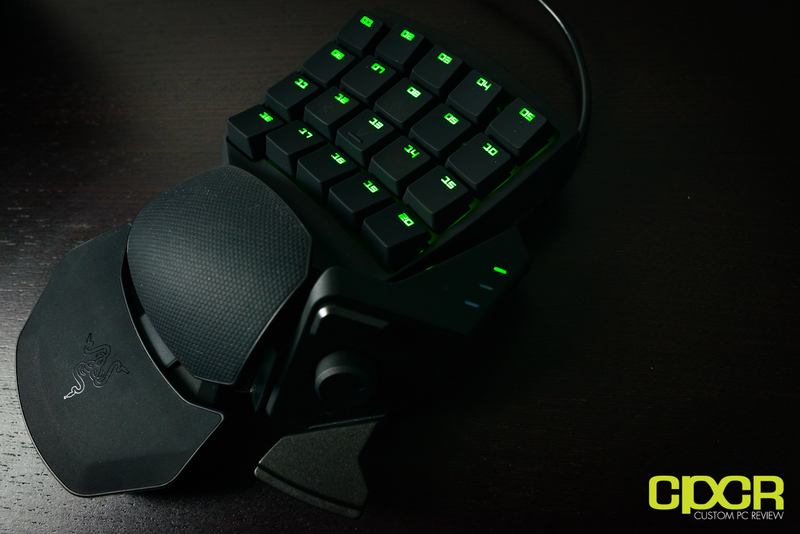 With the Orbweaver, the options are pretty limitless. As mentioned earlier, the keys on the Orbweaver are backlit, so you do have the option of changing the lighting settings as well. The options here are fairly basic as you can choose between a couple LED brightness settings along with an option to have the lighting pulsate. 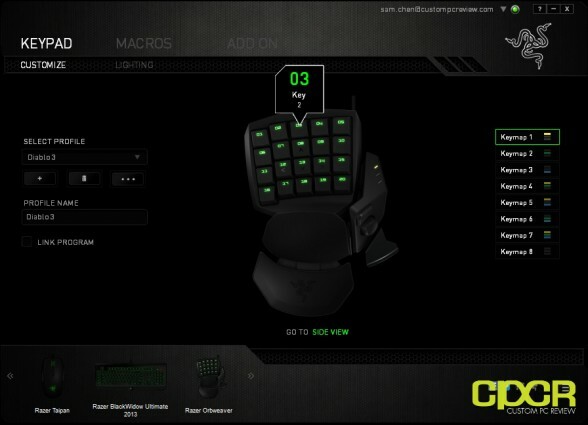 For performance testing, I tested the Razer Orbweaver in a number of different games to see if the keypad offered any sort of advantage while gaming. For FPS gaming, I played some Battlefield 3 along with some CS:GO and overall I didn’t notice much improvement in gameplay. Since FPS gaming doesn’t benefit much from setting macros, I pretty much played the games using the default keypad setup. After spending about two weeks with the Orbweaver, I still can’t really say that I’m seeing much improvement in gameplay versus using a standard keyboard. The spacebar button on the Orbweaver is too light and the position of the thumbrest is too much of a stretch for my hand so it simply isn’t all that comfortable. The upper buttons, even with the Orbweaver’s palmrest at the shortest setting was still too far of a reach for my fingers so changing weapons was a bit difficult. I also generally use a bit of my palm to hit the CTRL button while using a standard keyboard, so there was definitely a slight learning curve to using my pinky instead. The next game I spent some time playing was League of Legends, and being a game that pretty much only requires 4 keys on the keyboard to play, I didn’t notice any performance improvements here either. Given how difficult it is for my hand to reach the top row of buttons, I constantly found myself reaching for my keyboard instead. Finally, I also played some Diablo 3 to see if a different genre of game could benefit more from the keypad and it didn’t really do much either. Diablo 3, like League of Legends just doesn’t require all that much in terms of buttons so I didn’t find much improvement moving over to the Orbweaver. Alright, so after spending about 2 weeks gaming on this thing, I’d have to say that the Orbweaver (and I think the gaming keypad in general) is pretty cool, but it’s a very niche product designed for a very specific set of gamers out there. From the games I tested the keypad on, I didn’t see much of an improvement in my gameplay at all when compared to the good old keyboard. 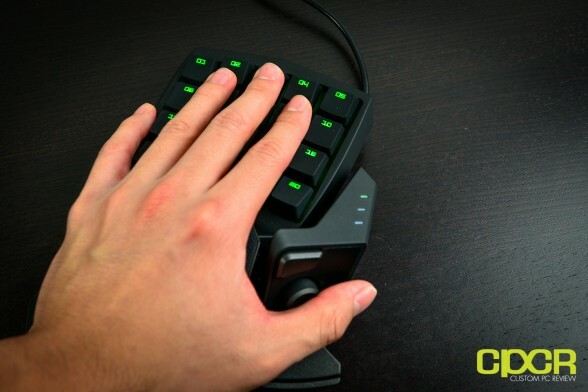 At least the Orbweaver can do everything a keyboard does and a bit more so if you’re willing to experiment, I think you might find a key combination or macro that would help improve your game. That said, I could see scenarios where the keypad could be superior. While I no longer actively play MMOs, I could definitely see the d-pad for example be a great WASD replacement for walking around the map while still allowing the rest of your fingers to continue casting spells on the move. I’m also sure there are a ton of people out there much more creative than I on setting up macros and finding better uses for the Orbweaver, so I’ll just leave it at that. Alright, so with that out of the way, let’s talk about the Orbweaver itself. In terms of the design and comfort aspect of it, I think the Orbweaver slightly misses the mark – at least for me personally. As you can see above, my fingers have very difficult time reaching the top row of buttons, especially the 1 and 5 button which is nearly impossible for my smaller hands. While the Orbweaver can be adjusted in length by adjusting the wristrest, it’s still too long for me at its default length. Those with larger hands though, this may not be an issue. As with any gaming peripheral, your mileage may vary I guess. On the thumbrest, I also had a difficult time using the d-pad along with the buttons there as well. The problem with the thumbrest is that the piece is too far out and while you can adjust the thumbrest, it only allows you to extend it further at an angle. For me, I had to either stretch my hand in order to use the keypad or shorten the thumbrest to use the keypad. Unfortunately by shortening the thumbrest, it’s very difficult to press the bottom button and it’s difficult to move the d-pad, so it’s quite awkward for me to use as well. Speaking of the d-pad and the bottom button, I feel like the bottom button needs to be a bit stiffer. As it is currently, I feel that it’s way too easy to accidentally press the button as it’s simply too light. As for the d-pad, I think an analog joystick would be a lot better here, but I can see how having a d-pad can be useful in some applications that require higher level of accuracy such as switching weapons in game, so I guess it’s just a personal preference more than anything. Pricing on the Razer Orbweaver is $129.99, which definitely makes it one of the most expensive gaming peripherals on the market. Even a full sized, fully backlit mechanical gaming keyboard like the Razer BlackWidow Ultimate 2013 is priced at $139.99, only a mere $10 more than the Orbweaver. Those who don’t yet have a mechanical gaming keyboard, I’d definitely recommend picking one up first prior to picking up the Orbweaver. You just get so much more bang for the buck. So to answer my original question. 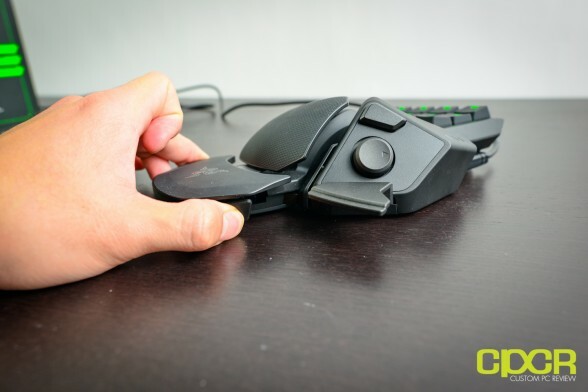 Is the Orbweaver reason enough to forget about the keyboard? Personally, I say no – not yet at least. At this point, my reservations are simply comfort and cost rather than utility though. 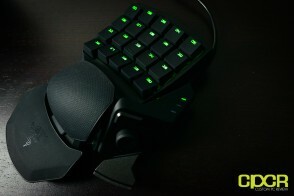 That said, I’m going to give credit where credit is due and mechanically, I think the Orbweaver is fantastic. I also think the concept of the gaming keypad is a good one as well. The Orbweaver really makes a lot more use of the thumb, which to me seems underused when gaming on a regular keyboard. After all, not all games even use the spacebar to begin with. Hopefully with a couple minor tweaks, the next Orbweaver could finally be a compelling reason to ditch that silly old keyboard. Today, it’s only reason for a very specific crowd. i’ve got one of these from the early 00’s before razer aquired nostromo, still use it to this day. one of the best periferals around in my opinion. Thank you for the information. Despite not being a user of the device it was informative, I’d love to see this reviewed by a Nostromo user. 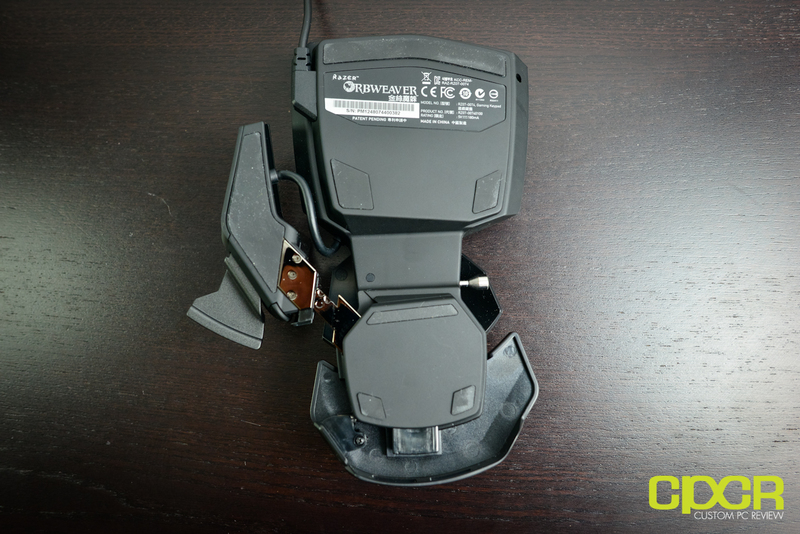 It is fun to see a review from someone who always uses a k/b mouse combo but it is more helpful to me to get one from someone who regularly uses this type of device. Kinda like, but not the same as, a review from someone who doesn’t drive cars isn’t a useful as a review from someone who has. I love the nostromo and rarely play without it. If I couldn’t use it I’d probably leave computer gaming. I love that thumbpad for many different games. At this point it feels so much more natural for me to use that thumbpad to move around than the 4 keys on my kb. This new device is interesting to me because of the mechanical switches. I wonder if this makes the thumbpad better than the older devices I have here, They did not need the extra row of buttons and I think addition impacted the look of the device in a negative way. I don’t mean to Necro but this needs to be said. As a nostromo user i could instantly tell that the orbweaver was much more precise and faster. with the Nostromo there was a chance you could press a button and not get a response, with the orbweaver the keys are very easy to touch and use. especially the space bar. The nostromos space bar sometimes felt like it was grinding and hard to press, the orbweavers is a huge upgrade. To comment on your ” extra row of buttons”. coming from the nostomo, i think the extra row is what makes this a winner. it was very hard for me to touch the 12 and 13 key on the nostromo, the orbweaver feels very natural, no matter what i button i press. And really the look isnt what im worried about on the game pad, its the practicality and usefulness over a gaming keyboard. 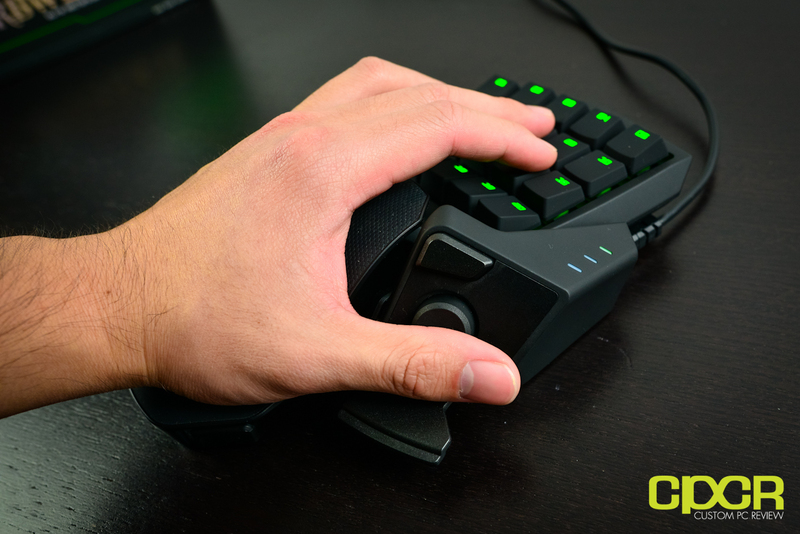 The orbweaver is a game changer. I would recommend it over a Nostromo. But do not forget, people are not kidding when they say this thing is loud. I was surprised. Get the stealth version if possible if not either way you’ll love it. by the way. who cares about the cord anyways? its rubber. just like everything else i have, i don’t need it for a survival mission like everyone else who complains its not braided. hope this helps future buyers/researchers. As far as cost goes. i would buy this over a top dollar full keyboard everyday all day. Make the switch you wont reget it.